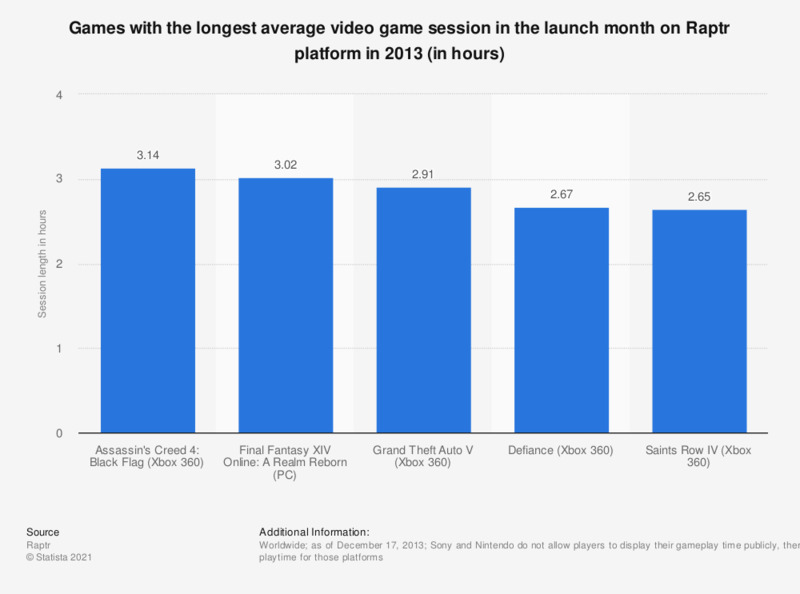 This statistic shows the longest average session length during the launch month of the games with the longest average session times on the gaming platform Raptr in 2013. Raptr users played their longest sessions without a break while playing Assassin's Creed 4, with the longest average session time amounting to 3.14 hours of uninterrupted play. Raptr is an online gaming platform and community with over 23 million users in over 100 countries. What are your first impressions of the video game Zelda: Breath Of The Wild? What are your first impressions of the video game Horizon Zero Dawn? Did you like the video game For Honor? Did you like the video game Nioh? Do you like the video game Mafia 3? Do you like the video game Battlefield 1?